Sideways Orion | "The best thing that we're put here for's to see; /The strongest thing that's given us to see with's/ A telescope. " One of the best meteor showers of the year takes up most of the month of December, but will be best on the mornings of December 13 & 14. Rising ENE a little after 7 PM, the radiant of the Geminids is up nearly all night. As always, the best time to watch for meteors is in the hours between midnight and dawn, since that’s when your sky is facing the direction Earth is traveling, so heres a map for December 14 at 2 AM. The sky from 42º latitude at 2 AM on December 14, 2018. Note Orion toward the SW, and the Big Dipper in the NW. Click for bigger image. Conveniently, the Moon sets at about 10 PM the evening before, so if you can get away from city lights, you’ll have good dark skies for the best observing time. This is an active shower though, so it’s work going out and looking anytime you happen to be up and the weather is clear. According to the AMS, the Geminids have a peak rate of about 120 meteors per hour (or about 2 per minute), tying them with January’s Quadrantids for highest rate. The usually lousy weather of December makes them much less famous, and harder to watch, than the August Perseids. Additionally, Earth&Sky points out this shower has a high number of earth-grazers – meteors that come in at a low angle and appear slow moving. They’re actually moving pretty fast – they’re coming up from behind and hitting the Earth, like a stone hitting your back or side car windows while you’re driving down the road. They’re rare, but memorable, and only visible in the evening. So get out and look for Gemini as often as you can from now ’till Christmas! I guess I must be having a lot of fun, because it sure doesn’t feel like four months has passed since I last logged in here. But there’s a naked-eye comet out there, so I couldn’t let it go by without saying anything! Comet 46P/Wirtanen is no Hale-Bopp or Hayakutake, but it’s a lot brighter than anything we’ve seen in the northern hemisphere for quite a while. It’s current observed magnitude comes in at a 5.4, making it about the same brightness as M13, the great cluster in Hercules. Experienced observers know this means it is visible to the naked eye, but only just, and only under ideal conditions when you know exactly where to look. The good news is, it’s expected to get brighter. It’s also positioned perfectly for evening viewing in the northern hemisphere, and a pair of binoculars is all you need for a great view. Many things affect how bright a comet appears, so predicting it can be a bit tricky. It should be brightest on December 16, but it’ll also be right next to the Moon that night, so looking a few days before or after is a good idea. 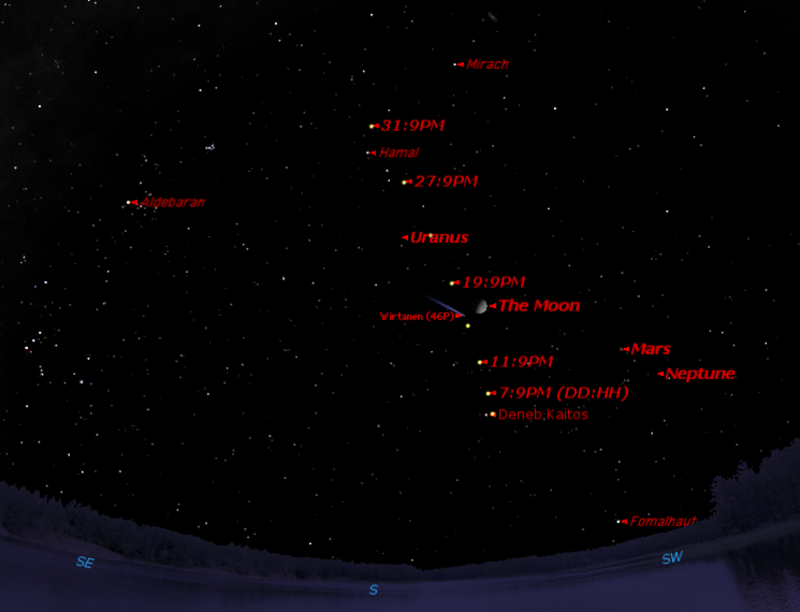 Here’s a chart for 9 PM on December 16, with the position of the comet on several other dates noted. The sky on December 16, 2018. The yellow dots indicate the positions of comet 46P/Wirtanen at 9 PM on several other evenings between December 4 (under the arrow pointing to Deneb Kaitos) through December 31. On December 4 – 5, it’s right next to Deneb Kaitos, one of the brightest stars in Cetus. It’ll pass less than 5º from Uranus between the 22 & 23. On the 29th, it’ll pass Hamal, the brightest star in Aries. If you’d like regular updates, or charts for your location, check out the comet 46P/Wirtanen page on LiveSky.